Here’s what I did in my short time, and what I’d do differently. I landed 15 hours and 2 days after I left, having officially gone forward in time! After checking into my hotel in Wan Chai and getting settled, I decided the best way to fight jet lag was to get out in the sun. My travel group took a cab down to south Hong Kong island to visit the village of Stanley, a European-looking waterfront area about 30-40 minutes south of the central districts. We got fantastic fish and chips at the memorably named Pickled Pelican, an English-style pub and harborside cafe. This was followed by a stroll through the crowded market (small, but interesting, had both souvenirs and some artwork). By the time I was back at the hotel, the jetlag had won and I grabbed some food from a nearby deli to snack on before falling asleep early. Took a day trip to Lantau Island to see the Big Buddha! I loaded up my Octopus card and took the MTR out to Ngong Ping. I had bought tickets online in advance for the cable car, which I highly recommend - the lines can get incredibly long to buy tickets. Even with pre-purchase, it was still a good 20 minute wait in line to board. The Big Buddha, officially known as the Tian Tan Buddha, is an impressively large site. Home to a monastery, many hiking trails, and a wide variety of shops and tourist-trap restaurants. The Buddha statue and site itself has only been around since 1993. I climbed all 268 steps to the top, and if that wasn’t enough, I also took a walk out to the Path of Wisdom, one of the quicker hikes. Afterwards, it was time for a late lunch. I took a bus down to the nearby fishing village (and also tourist stop) of Tai O. It being the weekend, it was incredibly crowded! A lot of Hong Kong-ers come to pick up their dried fish in this village. After wandering the canals, bridges, and narrow streets, I had a rather underwhelming lunch of some sort of rice pudding at a place along the canal. After my trip, I was told it was worth the walk out to the Tai O Heritage Hotel for the beautiful building and the restaurant. From there I took a lengthy bus ride around the island of Lantau to get back to the Ngong Ping station, where it was another lengthy MTR ride back to my hotel in Wan Chai. After that, I wasn’t up for much else that day. #1 If you want to go to bars in the Long Kwai Fong district on the weekends, there is a line to get in. Not to one of the bars. To the entire area. This is due to the steepness of the street and the uncontrollable crowds at peak times. #2 The longest outdoor covered escalator in the world is the Central-mid-Levels escalator at 2600 feet in length. It runs downhill only during morning rush hour, and the rest of the time runs uphill. #3 Cat Street market is on a street called Upper Lascar Row. 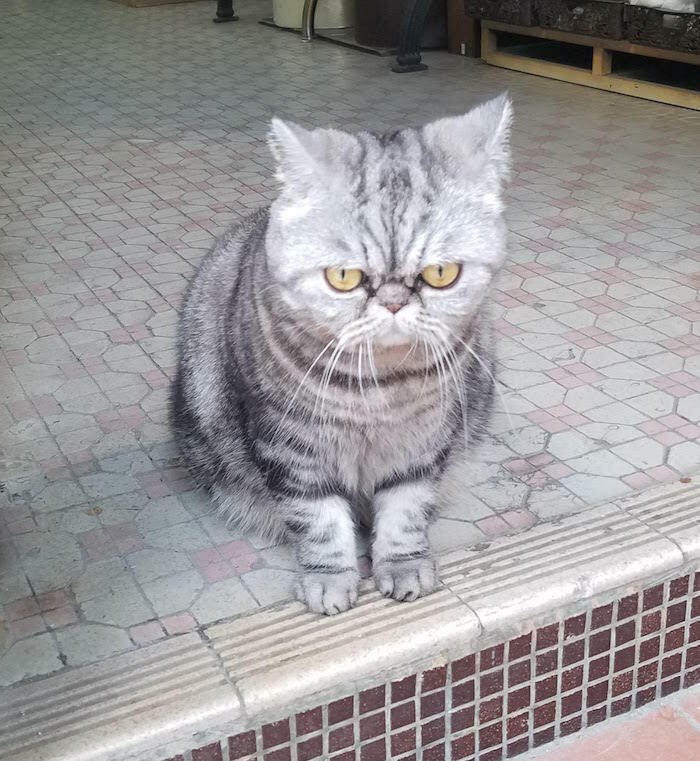 It is not a cat-themed market, although I found an excellent grumpy cat guarding one of the stores. It’s called that because decades ago it was known to sell stolen goods, and a ‘cat’ was a vendor who sold those stolen goods (the buyers were ‘rats’). I picked up some very nice jewelry while there. The best part of Cat Street is this cat standing guard over one of the shops. Besides passing these sites by, we also stopped by Man Mo Temple, one of the older temples in the city. The atmosphere was beautiful and spiritual. The smoke from the burning incense was a bit overwhelming. Visitors can purchase incense and offerings to leave on one of the altars. Apparently this was a slower day due to rain - at Chinese New Year the line to enter and say your prayers goes down the block, and you can barely see inside due to the smoke! After the tour I wandered over to Hong Kong Park, where I came across the free bird aviary. Both the park and the aviary are fantastic areas to wander around, and I recommend it. I went for a late vegetarian dim sum lunch at Lock Cha tea house, which is within the park. It’s a bit overpriced, but is a fantastic experience. Next door hosts a museum collection of tea sets. I took a Star ferry from Wan Chai over to Kowloon, which took all of 10 minutes. Exiting into more shopping centers, I walked along the waterfront of Tsim Sha Tsui to see the views back towards Hong Kong Island as well as the sculptures along the waterfront. I walked inland and passed the very luxe Peninsula Hotel, where I stopped in to both check out their historic lobby, and also to utilize their restroom. The Peninsula is known for their afternoon high tea service - walk-in only, no reservations. Pro-tip: Whenever you need to use the restroom in a major city, find the closest nice hotel and pretend you’re there for either the restaurant or for high tea. Tourists often dress for comfort so no one will think otherwise of what you’re wearing. I got cash from an ATM and took the MTR up two stops to the Ladies’ Market to check out their offerings of fake designer watches, purses, and more. All prices were negotiable. I am a terrible haggler, but did pick up a couple of scarves and a watch that is still functioning a month later. As the sun was setting, I hung out by the waterfront a bit on the way back, enjoying seeing the lights come on over the city. Eventually I hopped the ferry back to Wan Chai. I headed out early to ensure that I was at the ticket counter for the Victoria Peak tram by 10am. At that time (midweek) I had to wait for about 3 people to buy tickets in front of me before I could by my ticket with my Octopus card. The tram ride up to the peak is incredibly fun, as you’re seeing the city rise up behind you at a diagonal. At the top, we were forced through another souvenir shop and yet another mall to get up to the roof to see the view. There’s very little signage, so it’s unclear on where to go. If you head straight up to the top, You find the entrance to the Overlook. You can pay about $6.50, then head out to a wide rooftop with some interesting signage about the development of Hong Kong. There you’ll get harassed by various photographers who want you to pay them to take your picture. It wasn’t too busy that morning, so I was able to shoo them off and take my own pictures. On my way back down, I went through another exit and found that walking down the road, you see almost the same view without getting hassled to buy photos. The roof Overlook was cheap, at least. By the time I got down to the tram base (about noon), there were about 100 people in line waiting to get up. I was glad I went early! From there, it was back to the hotel to grab my suitcase and head to the airport!